A dream called fashion : B&W always right! ieri sera sono stata a cena con il mio ragazzo e volevo mostrarvi il look indossato. Siccome non ho avuto la possibilità di fare delle foto, in quanto era troppo buio; eccomi a casa davanti all'autoscatto, per riproporlo. Giacca bianca con profili in nero di Mosquito, pantaloni effetto cerato, sandali e maglia morbida in grigio. Spero che il risultato vi piaccia! last night I went to dinner with my boyfriend and I wanted to show you the look worn. Since I haven't had a chance to take pictures, because it was too dark, here I am at home in front of the camera with the self-timer, to propose it. White blazer with black profiles by Mosquito,waxed effect trousers, sandals and a soft t-shirt in gray. I agree with you: with B&W we are always in fashion. And this year is a big trend also! Very nice your jacket with the pants! Great outfit! passa da me.. c'è il secondo tema del gruppo! Buona Pasqua! Un abbraccio! beata te che puoi già mettere i sandali!! Really great look - love it! this is a great styling! loving your blazer a lot! You look stunnig. Excelent blazer and pants! These are beautiful photos! I really love that jacket! It is so lovely! Nice outfit! I love your jacket and all its details! Thank you for visiting my blog and for your comment! I now follow you and I hope you follow me back! Such a gorgeous blazer, of course i will follow you. ti aspetto nel mio blog, c'è un nuovo post, se ti va. I'm following you now! Follow me too?? THANKS FOR THE COMMENT, I AM NOW FOLLOWING. GOD BLESS! I love this outfit! And your hair is so pretty!! Carinissimo il tuo outfit, non troppo casual ma nemmeno troppo elegante...! amo il blazer! I reallly like the shoes and blazer especially. Let's follow each other, thanks for your comment, too. great pants honey, i have them!! mi piace moltissimo!! !soprattutto la giacca!ho un paio di scarpe molto simili!!!! Mi piace tanto la giacca! Great look! You can never go wrong with blac + white. Cool blazer and those heels are so cute. If you'd like follow me back? Cool look! I love the necklace. Love black and white! So classic! Your white blazer is amazing!! I followw you. I like your blog! 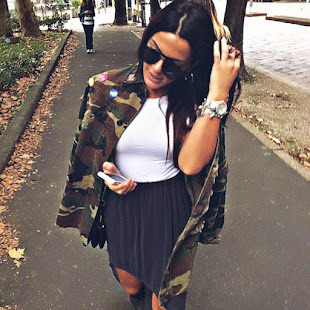 Came across your blog and really love your style! Would you like to follow each other? I'm definitely following yours now! Davvero carinissimo, un accostamento con cui non puoi sbagliare! your blazer is pretty ! happy easter dear !